September is Hunger Action Month™, when St. Mary’s and food banks across the country ask everyone to take action to fight hunger in their community, all month long. 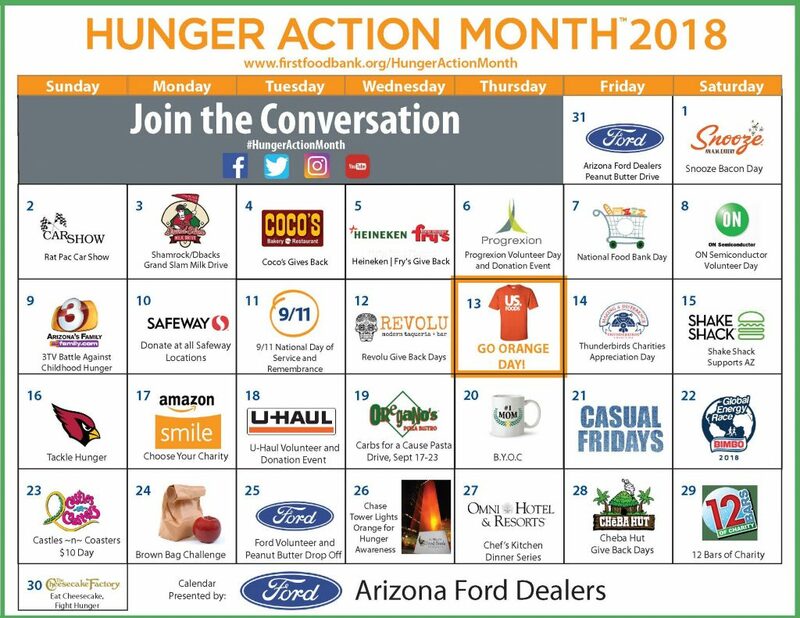 Hunger Action Month is an opportunity for you or your organization to join a movement that has a real and lasting impact on our efforts to alleviate hunger in Arizona. Click here to view calendar. Click each date for more information about each event or activity. Collect non-perishable food from employees during a designated week or month. St. Mary’s can deliver collection boxes, pick up the boxes when they’re full and provide a summary of pounds donated. Schedule your food drive online today. Pack emergency food boxes, sort food donations or distribute food to our clients. We can accommodate small and large groups during three-hour shifts in the morning or afternoon. It’s a great team-builder! Sign up now. Did you know 95% of the financial contributions that we receive help support our program expenses? In addition, $1.00 can provide 7 meals for individuals and families. Donate now. Click here to get more information about getting involved in Hunger Action Month. There are many opportunities for companies and organizations to get involved in Hunger Action Month! Whether it’s hosting an event, making a donation, or volunteering, participating in Hunger Action Month is a great way to join St. Mary’s in the fight against hunger.